Unfortunately, we had to make a last minute change to the published programme due to the unavailability of Oliver Cooper, who was to have been our speaker for the month. Stepping in, ELHAS members Jacki and Bob Lawrence delivered an illustrated talk entitled "Stalwarts of Leeds - a look at the lives of Leonora Cohen and Sir Montague Burton". Jacki and Bob work together delivering talks, with Bob taking care of the technical side and Jacki exercising her vocal chords and doing what she does best - talking. Jacki began the talk by explaining that although the title, 'Stalwarts of Leeds', was a wide ranging subject, she was only going to speak about two people that evening, Leonora Cohen and Sir Montague Burton. Beginning with Leonora Cohen, Jacki recounted her early life in Leeds, showing how the early death of her father, stone carver Canova Throp, and the subsequent hardships the family suffered, coloured Leonora's political views. It was what she experienced as a child that caused her to join the Women's Social and Political Union as an adult - the Suffragettes. 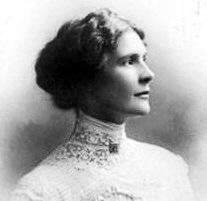 As a prominent suffragette, Leonora took part in many demonstrations and marches and was also involved in acts of civil disobedience which resulted in jail sentences. 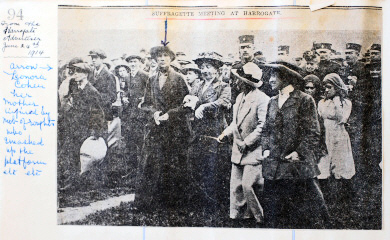 The audience were intrigued and amused to hear of some of her most famous exploits, such as the occasion in 1913 when she threw an iron bar at a jewel case in the Tower of London smashing it, and was seized by Beefeaters. They were even more amused to be told how Leonora escaped justice on a technicality, the cost of the repairs to the case being critical, causing the jury not to come to a satisfactory conclusion, and the case being thrown out. Using Leonora's own words and many contemporary photographs, Jacki continued with the story of Leonora's later political life. This included visiting Europe and beyond to look at working conditions and opportunities particularly for women. This saw Leonora holding office in such organisations as the Leeds Trade and Labour Council and the Yorkshire Federation of Trades Councils, the first woman to do so. The audience were amused again to hear that Leonora, during her years as a Leeds magistrate, frequently visited Armley jail, and on occasion saw the records that showed that technically she was still out on licence from a stint in the prison in 1913. This meant that she could have been recalled back to jail at any time. Jacki ended her talk about Leonora by quoting the words her husband Henry Cohen had written about her in his will, leaving everyone in the room glad to have been able to learn more about this remarkable woman. 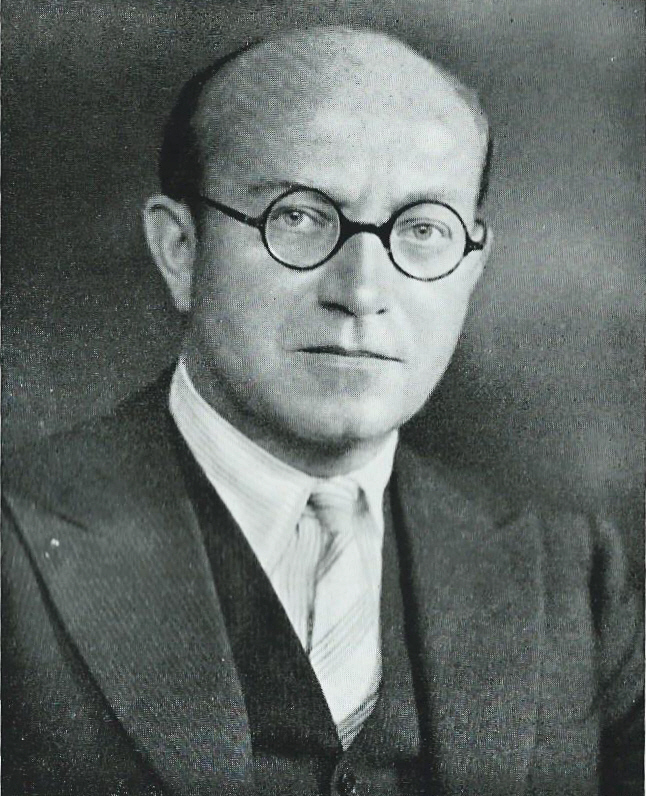 Moving on to Sir Montague Burton, Jacki began by explaining about his early life in Russian Lithuania and his subsequent journey to England, fleeing anti-semitic pogroms. Charting his first years in northern England, Jacki showed how, from a borrowed starting capital of £100, he built the huge clothing manufacturing empire that was known the world over. Whilst again it was the use of contemporary images that showed the growth of this vast empire, it was little anecdotes and quotes from Sir Montague that showed the character of the man, who declared that his workers were not hands but individuals, and strove to provide them with the best possible working conditions. Stating that the building of Hudson Road Mills was Sir Montague's greatest achievement, Jacki showed photos of the work rooms of the factory and the grounds which provided so many opportunities for the employees to get involved in sport and many other leisure activities. The audience were amazed to learn of the extent of the Burton Group operations and there were gasps of disbelief when told how the canteen at Hudson Road Mills could serve 10,000 meals within an hour. But it was not just Sir Montague's achievements in the manufacturing world which held the attention of the audience. It was also his charity work and his contribution to the war effort during WW2, with management and the workforce raising the money to donate a Spitfire to the Royal Air Force. Having been told that during WW2 Burton's also supplied one quarter of the uniforms for the British Armed Forces, they were perhaps not so surprised to be shown a map from the German War Office showing Hudson Road Mills as a target for the Lufftwaffe. Jacki continued to talk about the progress of the business following Sir Montague's untimely death in 1952, bringing back many happy memories for those there who had been employees at this huge Company. She ended the talk with a quote from Sir Montague which showed the ethos by which this great man had lived his life. Referring to charitable works he once said: "We forget ourselves when we think of others. You have no idea how much happiness we can feel if we are only charitable. The virtues, like seven lamps, light up the world and everything seems bright". The next meeting on Monday 29th April 2019 will be an illustrated talk by Ann Lightman, Friends of Lawnswood Cemetery, entitled "Behind the Chapel" This will be followed by our annual Pea & Pie Supper. Oliver Cooper will deliver his talk "Fifteen Years of Archaeological Investigation at Thorpe Park" on 24th June 2019.